Discussion in 'Stock 2002 - 2005 Explorers' started by Bob O, June 26, 2011. The compass indication is gone but the temp is still there. In place of the compass there are two dashes. What is the likely problem and how can it be fixed? It's a 2004 Explorer XLT. While we are looking for an answer to your question, how about mine. My compass always shows N or NE. I just found this post. Hopefully you haven't given up on us! Your compass may need to be re-calibrated. The info on how to do this is in the owner's manual. If you don't have an owner's manual, it can be downloaded here. Thanks BigRondo. My compass indication is in the dash, not the mirror. I suspect the only difference is how you access the zone and calibration. My owner's manual indicates you should press a button on the sensor. When I do that nothing happens. 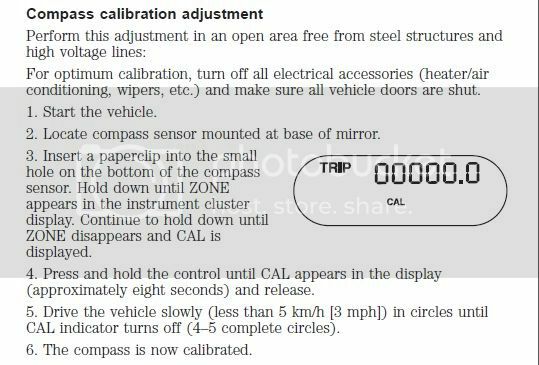 When I first turn on the ignition "zone" and "cal" are displayed in the compass position so I'm pretty sure they should indicate when the button is pushed. I suspect the sensor has just given up and failed. Bob, The part on the mirror is the compass sensor, and the readout is on the digital display on the dash. I don't have the message center so I may be giving you the wrong instructions. Do you have the message center? 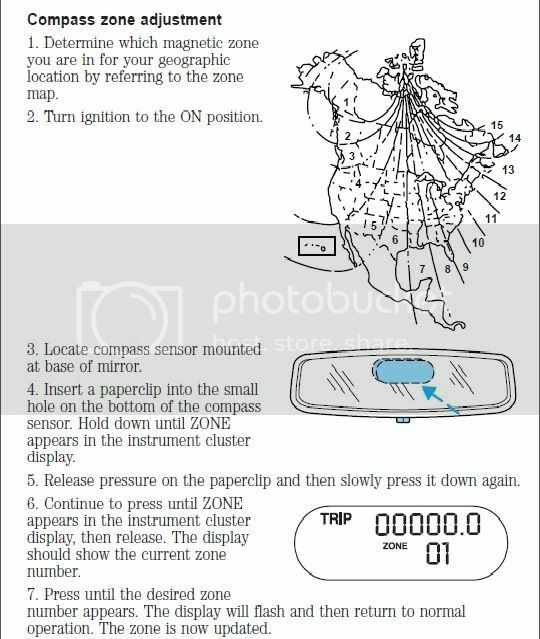 Do you have the compass sensor located at the base of the rear view mirror? my 2001 does this from time to time, all i have to do is is drive it in a tight circle three to four full revolutions and it reset/recalibrates. im serious not jerking your chain a buddy that works at a dealership told me about it. The box has the pinhole to do the reset with. I have another box from a different year Explorer (not sure what year) that has a pushbutton instead of the pinhole. Anyone know if the two are compatible? The newer box came complete with a mirror, garage door opener, etc so I could swap in the entire assembly. The newer mirror also has two buttons on it but I'm not sure what they operate. It could be from an Eddie Bauer or Limited edition but it came from a model w/out a sunroof because it's the longer length overhead console, not the shorter one that's used on vehicles w/sunroofs. It also included the entire wiring harness but I'm not crazy about pulling down the headliner to install; especially if it's not compatible w/the XLT model. Anyone ever do that swap? Does the headliner need to come down to do it? Thought I'd ask before trying the swap. I really miss this feature! Okay, swapped out the little box and the calibration worked great. Having that button to push sure is easier than trying to stick a pin in the hole and fiddling around with that. I have some wiring questions but I'll start a new thread for that one. Just glad to have my compass feature working again.